Red circles indicate earthquakes that occurred from 1974 to 2002 with magnitudes greater than 2.5. Green circles denote earthquakes that occurred prior to 1974. Larger circles indicate earthquakes of greater magnitude. Map: USGS/Joan Gomberg and Eugene Schweig. Likely formed in a supercontinent breakup as many as 750 million years ago, the New Madrid zone is, in essence, a crack in North America. This network of geologic faults in the South and Midwest produced the most powerful quakes to strike the eastern United States in recorded history. This series of temblors occurred in 1811 and 1812. With estimated magnitudes between 7.5 and 8.0, they were felt over a 1-million-square mile area. 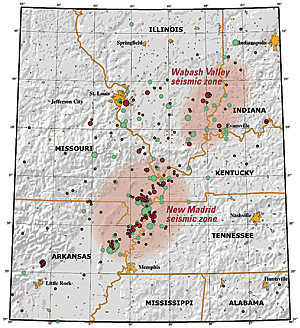 The seismic zone takes its name from the town of New Madrid, Missouri, which was destroyed in the first of those quakes. 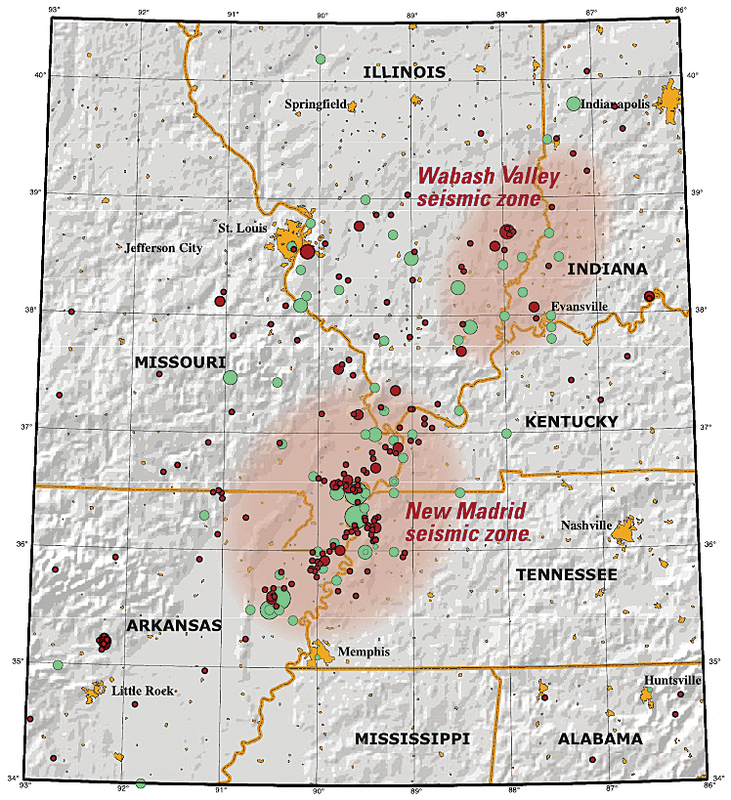 Since 1974, seismic-monitoring instruments in the New Madrid zone have recorded more than 4,000 quakes, most too small to be felt. However, the US Geological Survey and the University of Memphis Center for Earthquake Research estimate there's a 7 to 10 percent chance of a major quake—one with a magnitude between 7.5 and 8.0—occurring in the region in the next 50 years. According to a 2009 study by Virginia Polytechnic Institute and State University (Virginia Tech) and the University of Illinois, such a quake would result in as many as 86,000 injuries and fatalities and the displacement of 7.2 million people. "The scope is about as big as you could possibly have," said Jonathon Monken, director of the Illinois Emergency Management Agency and chairman of the Central U.S. Earthquake Consortium, a multistate partnership dedicated to reducing damage and loss of life from midcontinent quakes. "We'd expect significant or total destruction of more than 700,000 buildings, displacement of 2.5 million people, damage to 3,500 bridges, and a loss of power to not only the central United States, but—for a period of time—a third of the country. Putting it in a purely financial context, Hurricane Katrina was a $106 billion disaster. We estimate this would be a $300 billion disaster, the worst in the history of the United States."